Complimentary dining options abound on Carnival Conquest. You'll find two main dining rooms, a buffet, a burger joint, Mexican fare, fish and chips, and pizza. Most of the food gets average to high marks, with a handful of standouts; the Cezanne buffet is the ship's weakest culinary offering. On sea days, breakfast is served in the buffet (6:30 a.m. to noon) and at the BlueIguana Cantina (7:30 a.m. to 10:30 a.m.). Brunch is served in one of the main dining rooms (8:30 a.m. to 1 p.m.), while lunch is only served in the buffet and BlueIguana Cantina (both noon to 2:30 p.m.) and Guy's Burger Joint (noon to 6 p.m.). On port days, breakfast is served in the buffet and one dining room. Times vary depending on port arrival time but are generally 6:30 a.m. to 11:30 a.m. in the buffet and 7:30 a.m. to 9:30 a.m. in the dining room. The BlueIguana Cantina also is open for breakfast (7 a.m. to 10:30 a.m.). Lunch on port days is only available in the buffet, BlueIguana Cantina and Guy's Burger Joint. Room service also is available 24 hours a day, though breakfast choices are all cold options (cereal, yogurt and pastries). 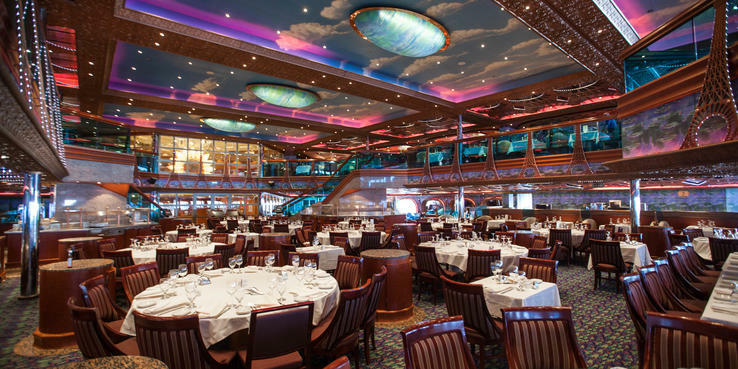 With almost all of the dining venues onboard Carnival Conquest included in the cruise fares, passengers will find just a handful of culinary options with surcharges. Dinner menus are the same in both restaurants and consist of "everyday" options, as well as daily selections that change nightly. Everyday choices include: chilled shrimp cocktail, fried vegetable spring rolls and a Caesar salad for appetizers; broiled fillet of Atlantic salmon, grilled flat iron steak, grilled chicken breast, Indian-style vegetables with lentils and basmati rice, and southern fried chicken with mashed potatoes and gravy as entrees. Sides available all nights are baked potatoes, steamed white rice, French fries and steamed vegetables. For an extra $20, cruisers also may order grilled lamb chops, filet mignon or New York strip from the Steakhouse any night of the cruise. Options from the rotating menus can include anything from seafood delicacies (broiled Maine lobster, jumbo black tiger shrimp) to meat dishes (roasted prime rib, barbecued pork spare ribs, beef stroganoff) and Italian favorites (minestrone, lasagna, spaghetti carbonara). There are always vegetarian options (chilled peach cream soup, black bean and vegetable enchiladas) and a "Didja" (as in "did you ever") choice that might include spicy alligator fritters, frog legs, and shrimp and redfish ceviche. Desserts also change every night, but Carnival's heavenly warm chocolate melting cake is always available, as are fresh fruit and a selection of ice cream flavors. Other choices might include apple pie, baked Alaska, tiramisu and a variety of sugar-free and low-fat cakes. The quality and variety of food in the main dining room is good; the lobster, in particular, got first-rate reviews from diners (many of whom had more than one lobster tail). Italian dishes also were quite tasty. Waiters asked every night how the food was, whether it had been cooked well enough and if the temperature was okay. Cezanne is divided into several distinct areas. Comfort Kitchen (called Good Eats for dinner), located near the main entrance, offers a variety of pasta, meat and fish options. Near the back of the buffet is a section called, on a rotating basis, Caribbean Favorites, Italian Favorites and American Favorites. The carving station is located there. On port days, only half of this section is open during lunch. You'll also find two dessert stations inside Cezanne. The smaller of the two is in the front and offers one cake choice, plus a variety of puddings. At the back of the buffet is the Sweet Spot, which typically has four or five cake varieties to choose from. Self-service beverage stations with lemonade, water, tea (iced and hot) and coffee are scattered throughout Cezanne, as well as near the aft pool outdoor seating area. Carnival Deli (11 a.m. to 11 p.m.): Situated (port side only) inside Cezanne between Comfort Kitchen and the Favorites buffet, this place serves up deli-style wraps and sandwiches. Cold choices include turkey wraps, tuna sandwiches, smoked salmon on a bagel, and arugula and pepper with mozzarella on ciabatta bread. Hot selections are pastrami or corned beef on rye, a grilled Reuben sandwich, roast turkey on a roll, grilled ham and cheese or an all-beef hot dog. Fish N' Chips (noon to 2:30 or 3:30 p.m.): You'll need to go up the steps at the back of Cezanne to get to this small food station, serving classic fish and chips, along with other items like seafood ceviche and fried oysters. Dipping sauces include tangy tartar, sweet chili and English mustard. Pizza Pirate (open 24 hours): Located at the back of the ship, just outside Cezanne, near the Sky Pool and Sky Bar, Pizza Pirate is the only spot on the ship to grab a slice of pizza. But don't expect to grab and go. Every time we stopped by during lunch, there was always a wait. Choices include margherita, mushroom, pepperoni and four cheese. Swirls (open 24 hours): Ice cream 24/7. There are three Swirls self-service soft ice cream and yogurt stations located on Deck 9 -- two on either side of the entrance to Cezanne near Guy's Burgers and BlueIguana Cantina, respectively, and one near the aft Sky Pool. Guy's Burger Joint (Deck 9): This poolside Lido Deck venue comes to Carnival cruise passengers via a partnership with celebrity chef Guy Fieri, and it's a burger-lover's paradise. You can build your own or choose from five pre-designed burgers, from the Plain Jane to Chilius Maximus (a burger with super melty cheese, an onion ring, donkey sauce and chili) or the Pig Patty (a patty made out of bacon topped with cheese and donkey sauce). There's also a toppings bar with everything from lettuce, tomato and pickles to caramelized onions and sauteed mushrooms. Lines during prime lunch hours are long, but they move fast. Vegetarians can ask for a veggie burger instead of a beef burger. There are no turkey burgers (nor are there any to be had in the buffet). Fries come standard, as well. Guy's Burger Joint open noon to 6 p.m. The Point Steakhouse (Deck 10 mid); $38: Located in an intimate spot on Deck 10, the Point Steakhouse is a great date or special occasion spot. The service is first-rate and the food excellent. Menus consist of appetizer, salad, entree and dessert choices. Start with escargot, grilled Portobello mushroom, beef tartare or a New England crab cake (just to name a few of the choices). Then move on to a salad before choosing from four steak options (New York strip, cowboy, ribeye, filet mignon), plus surf and turf, broiled lobster tail, rosemary-infused chicken, grilled lamb chops, Maine lobster ravioli and a grilled fish of the day. No matter what you choose, you really can't go wrong. Hours are 5:30 p.m. to 9:30 p.m.
Sushi at Sea (Deck 9, aft); a la carte: On offer are four sushi or sashimi options, as well as rolls. Prices start around $2 per piece. Diners place their order at the counter, are given a pager and then paged when their order is ready. The Chef's Table (location varies); $75: Available on all Carnival ships, the Chef's Table is the closest you'll get to a gourmet experience on Carnival Conquest. Before the multicourse meal is served, diners are invited to tour the ship's galley with the head chef while sipping complimentary wine. The event is limited to a dozen passengers; it's held once to three times per cruise, depending on demand. Cafe Fans (Deck 5, midship); a la carte: Located on the interior Promenade along Deck 5, Cafe Fans serves up specialty coffees, teas and chai lattes, plus milkshakes, hot chocolate, cookies and slices of swoon-worthy cake. Prices range from $1.95 to $5.95. Green Eggs and Ham Breakfast (main dining room, Deck 3); $5: Offered just once per cruise, this fun family-centric breakfast is for Dr. Seuss-lovers (young and old alike). Held in one of the main dining rooms, the decor is decidedly Seuss with red and white tablecloths and napkins and pompom-esque centerpieces. The Cat in the Hat and Things 1 and 2 make appearances and pose for photos with kids. The best part is the menu with items like green eggs and ham (they really are green! ), French toast coated red and blue and topped with Fruit Loops, regular and red pancakes stacked high, and striped yogurt parfaits.